Q: Your venture Personal Story Films came about after you produced a documentary about your father. What prompted you to do the documentary and how did that lead you to want to start the film organization? A: I was lucky to have an interesting and wonderful man as my father. As he was aging, I wanted to capture the stories that he’d shared with us, so I decided to do a series of interviews with him about his life. I also wanted to hear in more depth the story of how he got into his profession and how he ended up making such an impact. I found out so much more about him than I had known before! Who knew that he had made a den for foxes near the woods where he grew up. And what it was like for him during the Nazi occupation of Denmark, when he was a teen. He talked about bicycling off in the middle of the night to do rifle training with members of the Danish resistance. He told me about the shortages of food and other goods, and how he learned to make do. I captured these stories and many more, as well as his dry sense of humor and kind spirit. It was actually my father’s idea to do this as a service for other people. I realized that I have a passion for listening to and preserving the marvelous stories that older people have to tell. I am incredibly grateful to have the film of my father, now that he has passed away. It will be watched by my generation, the ones to come, and the network of people that he has influenced. I think everyone should have such a film in order to fully remember and appreciate their parents, grandparents, and other loved ones. Q: Why do you think it's important for people to record their stories and memories for future generations? A: Personal histories or memoirs of any kind (written, filmed, or oral) have an obvious benefit for the families of the storytellers. We children gain a connection to our history and culture, a window into what life was like back then, and understand more about why we are who we are. And we have something tangible to help us cherish the memories and unique personalities of our loved ones. But it's also of great benefit to the people telling their stories. Sharing their life stories and the lessons they've learned helps people feel a sense of purpose and meaning, find a sense of identity, and a sense of peace and hopefulness that they didn't have before. Q: What are some of the poignant stories that you have filmed so far? “Suddenly the Germans came in...I was about 11...we just took a small suitcase and went down to Italy, and finally found a ship to sail on, and went out through the Strait of Gibraltar, and just after we went, Italy was at war. So we just made it." Q: Is it an emotional experience for those telling their stories? Are they ever overwhelmed? A: In general, it's a positive experience. I haven't seen people become overwhelmed yet, though I know it's possible. I've encountered a couple of people who wanted to do a film about their parents but the parents didn't want to because their stories were still too painful. Some people are unwilling to re-experience trauma and I respect that. If they knew me personally they might be more willing, because I am very sympathetic and easy to talk to, a good listener. I am comfortable with expressions of emotion and it can be a very healing process. Q: What are some of the reactions you have received to the films? "You have done an extraordinary piece of work putting it together and editing it so well." "Such a wonderful film. And a great gift." "It really captured the family spirit of the occasion." "Thank you so much for the film! You did a wonderful job. I will keep it the rest of my life!" Q: What is your experience prior to starting this venture? A: I earned a bachelor of arts in television production in 1982, and went on to work as a videotape editor for news and documentaries at the local public television station, WGBH-TV. While I was there, a series of documentaries I edited about private violence was nominated for an Emmy. Since then, I have directed and produced many documentaries and short videos on various topics. I have also taught video production classes at Adult Education and in conjunction with the English Language Program at Boston University. A: Many elders are unassuming and think that their stories aren’t important. I think they don’t realize what treasures they really are! They have lived long lives, experienced history first hand, and learned some lessons along the way. They may not feel extraordinary, or particularly wise, but each person has a unique story to tell. Also, storytelling knits our communities together. Not too long ago, it was common for three generations of a family to live together. Now, families get split apart, children move away, and elders end up in their own housing communities or nursing homes. People of all ages have become more lonely and isolated from their families. We crave a link to the past, and search out our roots. It is more important than ever for grandparents to share their experiences, life lessons, and cultural traditions. It’s really an extraordinary gift. Do you remember the stories your parents and grandparents told you? Probably not all of them, or in all their details. Memoirs convey these stories in the voices and words of the people who lived them, with the accompanying detail, emotion, and lessons learned. Most of us would give a lot to have such a legacy from our grandparents or their forbears. For those of us who have older family members who are still alive, it makes sense to record their personal histories now. For several years, I had been working on a video documentary about my father. I filmed him telling stories: about taking care of chickens with his mother, fishing with his father, being a teenager during the Nazi occupation of Denmark, and how he proposed to my mother. I also captured his warmth, intelligence, and dry sense of humor. This past September, I finally finished the film. Then in October, he died. You can imagine how gratified I am to have this biographical film of his life! Something rich and alive to remember him by and to pass on to the grandchildren, great grandchildren, and so on. The entire process of making this film - interviewing my father, getting footage of him involved in activities, the long, creative job of editing - drew me closer to him in ways that I had not expected. I also learned things about him and heard stories I had never heard before. 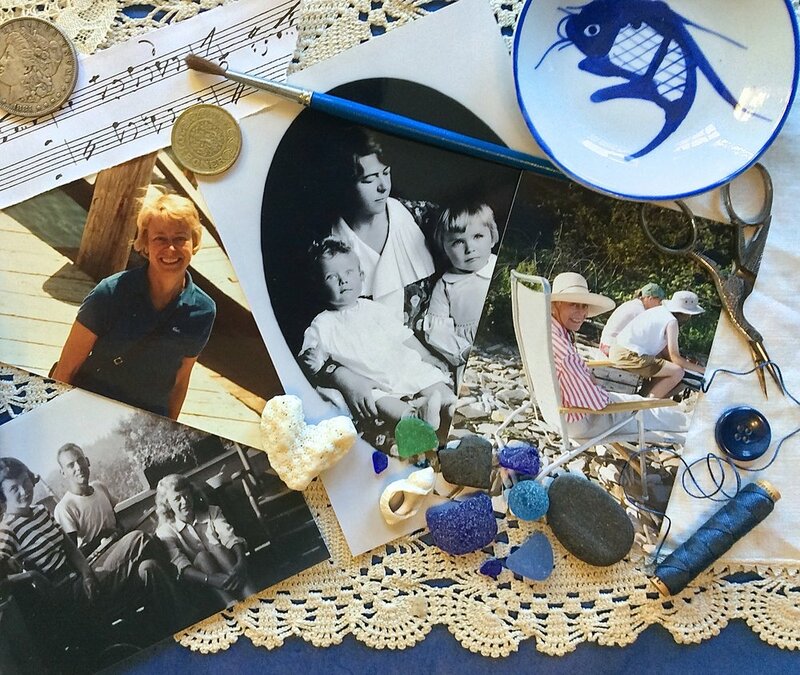 I realized that I would love to make personal history films for other families, so they might also have a way to appreciate, remember, and pass on the heritage of their elder family members. According to research, a large majority (74%) of people over 45 would rather inherit life lessons and values from their parents than money*. Personal histories, or memoirs, (written, filmed, or oral) have an obvious benefit for the families of the storytellers. We children gain a connection to our history and culture, a window into what life was like back then, and understand more about why we are who we are. Life stories can take the form of a written memoir, with or without a ghost writer or personal historian. Some people record stories on digital audio and create a slide show. Others make photo montages with music, sew quilts, create collages, or collect recipes for a cookbook/memoir. Film is my favorite medium - it pulls us right into the room with the storyteller. The emotional impact of our family member’s experience comes across - we see it on their face and hear it in their voice. In a moving picture, the subject’s personality is captured along with their stories. Their sense of humor, perhaps expressed through a wink or twinkle in the eye, their unique storytelling style, and the expressions on their face, are all preserved. As Isak Dinesen said, “To be a person is to have a story to tell.” Throughout human history, the older people of a family have used stories to pass along wisdom, make sense of the world, and preserve the history of a society. Not too long ago, it was common for three generations of a family to live together. Now, families get split apart, children move away, and elders end up in their own housing communities or nursing homes. People of all ages have become more lonely and isolated from their families. We crave a link to the past, and search out our roots. It is more important than ever for grandparents to share their experiences, life lessons, and cultural traditions. The storytellers feel a stronger sense of identity and meaning, resilience and peace. The younger generations receive a connection to our heritage, and the enduring gift of our loved ones’ story, personality, and wisdom. And I have my father’s unique voice, sense of humor, and storytelling style preserved on film forever.